Eapen S, George L (1990) Ontogeny of somatic embryos of Vigna aconitifolia, Vigna mungo and Vigna radiata. Annals of Botany 66, 219-226. Eapen S, Gill R (1986) Regeneration of plants from cultured root explants of mothbean (Vigna aconitifolia L. Jacq. Marechal). Theoretical and Applied Genetics 72(3), 384-387. Eapen S, Köhler F, Gerdemann M, Schieder O (1987) Cultivar dependence of transformation rates in moth bean after co-cultivation of protoplasts with Agrobacterium tumefaciens. Theoretical and Applied Genetics 75(1), 207-210. Eapen S, Ravinder G, Rao PS (1986) Tissue culture studies in mothbean. Current Science, India 55(15), 707-709. Egawa Y (1988b) Phylogenetic differentiation between three Asian Vigna species, V. radiata, V. mungo and V. umbellata. Bulletin of the National Institute of Agrobiological Resources, Japan(4), 189-200. Egawa Y (1991b) Phylogenetic relationships in Asian Vigna species. 87-94. Egawa Y, Nakagahra M, Fernandez GCJ (1988b) Cytogenetical analysis of tetraploid Vigna glabrescens by interspecific hybridization involving diploid Asian Vigna species. 200-204. El-Shemy HA, Mutasim K, Wakasa K, Ishimoto M (2002) Reproducible transformation in two grain legumes - soybean and azuki bean - using different systems. 7(2B), 709-719. Ellis RH, Lawn RJ, et al. (1994a) Towards the reliable prediction of time to flowering in 6 annual crops .4. Cultivated and wild mung bean. Experimental Agriculture 30(1), 31-43. Eusebio PS (1991) Effect of dehulling on the nutritive-value of some leguminous seeds as protein-sources for tiger prawn, penaeus-monodon, juveniles. Aquaculture 99(3-4), 297-308. Evans IM, Boulter D (1974) Chemical methods suitable for screening for protein content and quality in cowpea (Vigna unguiculata) meals. Journal of the Science of Food and Agriculture 25(3), 311-322. Fageria NK, Baligar VC, Wright RJ (1991) Influence of phosphate rock sources and rates on rice and common bean production in an oxisol. Plant and Soil 134(1), 137-144. Fan C, Lee C (2001) Purification of D-hydantoinase from adzuki bean and its immobilization for N-carbamoyl-D-phenylglycine production. Biochemical Engineering Journal 8(2), 157-164. Farnham MW, Griffith SM, Miller SS, Vance CP (1990) Aspartate aminotransferase in alfalfa root nodules. III. Genotypic and tissue expression of aspartate aminotransferase in alfalfa and other species. Plant Physiology 94(4), 1634-1640. Faroda AS (1972) Effect of seeding rate and row spacings on fodder production of moth bean (Phaseolus acontifolius). Annals of Arid Zone 11(3/4), 183-186. Faroda AS, Singh RC (1980) Grow pulses as a catch crop. Indian Farming 30(2), 15-16. Feng ZZ, Kobayashi K (2009) Assessing the impacts of current and future concentrations of surface ozone on crop yield with meta-analysis. Atmospheric Environment 43(8), 1510-1519. Fery RL (1980) Genetics of Vigna. Horticultural Reviews 2, 311-394. Firake NN, Bangal GB, Gutal GB (1994) Effects of contour planting of mataki with subabul on soil moisture and fodder yield. Journal of Maharashtra Agricultural Universities 19(1), 141-142. Flores M CM, Madriz I PM, Warnock de Parra R, Trujillo de Leal A (2005b) Plant height and yield components of six genotypes of the Vigna genus in two locations of Venezuela. Revista de la Facultad de Agronomía, Universidad del Zulia 22(4), 351-364. Ford CW (1982b) Accumulation of O-methyl-inositols in water-stressed Vigna species. Phytochemistry 21(5), 1149-1151. Fox CW (1993) A quantitative genetic analysis of oviposition preference and larval performance on two hosts in the bruchid beetle, Callosobruchus maculatus. Evolution 47(1), 166-175. Fox CW, Tatar M (1994) Oviposition substrate affects adult mortality, independent of reproduction, in the seed beetle Callosobruchus maculatus. Ecological Entomology 19(2), 108-110. Frenken G, Hornetz B, Jaetzold R, Willems W (1993) Actual landuse advice in marginal areas of SE-Kenya by atmosphere-ocean-telecommunication. Tropenlandwirt 94(April), 3-12. Fujihara S, Abe H, Minakawa Y, Akao S, Yoneyama T (1994) Polyamines in nodules from various plant-microbe symbiotic associations. Plant and Cell Physiology 35(8), 1127-1134. Fujihara S, Abe H, Yoneyama T (1995) A new polyamine 4-aminobutylcadaverine: occurrence and biosynthesis in root nodules of adzuki bean plant Vigna angularis. Journal of Biological Chemistry 270(17), 9932-9938. Fujihara S, Terakado J, Nishibori N (2006) Accumulation of an aromatic amine, β-phenethylamine, in root nodules of adzuki bean Vigna angularis. Plant and Soil 280(1/2), 229-237. Fujihara S, Terakado J, Takenaka M, Yoneyama T (2002) Specific occurrence of β-phenethylamine in root nodules formed from Bradyrhizobium-legume symbiosis. Plant and Soil 238(1), 123-132. Fujii K (1983) Resource dependent stability in an experimental laboratory resource-herbivore-carnivore system. Researches on Population Ecology(Supplement 3), 15-26. Fujii K (2009) Cause of egg mortality in azuki bean weevils (Callosobruchus chinensis): physical or chemical? Population Ecology 51(1), 99-104. Fujii K, Miyazaki S (1987a) Infestation resistance of wild legumes (Vigna sublobata) to azuki bean weevil, Callosobruchus chinensis (L.) (Coleoptera: Bruchidae) and its relationship with cytogenetic classification. Applied Entomology and Zoology 22(2), 229-230. 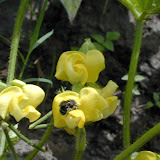 Fujii Y (2000) Allelopathy in Vicia, Mucuna and related leguminous species. 191-204. Fujii Y, Kageyama D, Hoshizaki S, Ishikawa H, Sasaki T (2001) Transfection of Wolbachia in Lepidoptera: the feminizer of the adzuki bean borer Ostrinia scapulalis causes male killing in the Mediterranean flour moth Ephestia kuehniella. Proceedings of the Royal Society of London. Series B, Biological Sciences 268(1469), 855-859. Fujine O, Akino S, Kondo N, Naito S (2003) Toxic activities of bud cell culture filtrates of Fusarium oxysporum f.sp. adzukicola to calluses of adzuki bean cultivars. Memoirs of the Graduate School of Agriculture, Hokkaido University 25(2), 195-202. Fujita I, Nishimune A, Watanabe K (1978) Studies on the application of slow-release nitrogen fertilizers to the main crops in the brown andosol of Tokachi district. 1. Effect of slow-release nitrogen fertilizers on the main crops at a standard nitrogen supply. Research Bulletin of the Hokkaido National Agricultural Experiment Station(120), 51-74. Fujita K, Ofosubudu KG, Ogata S (1992) Biological nitrogen-fixation in mixed legume-cereal cropping systems. Plant and Soil 141(1-2), 155-175. Fujita S (2007) Studies on the breeding of Adzuki bean cultivars resistant to Adzuki bean brown stem rot (BSR) and Phytophthora stem rot (PSR). (115), 55 pp. Fujita S, Kondo N, Shimada H, Murata K, Naito S (2007) Re-evaluation and selection of adzuki beans to breed cultivars resistant to new race of Phialophora gregata f. sp. adzukicola, the causal agent of adzuki bean brown stem rot (BSR). Breeding Research 9(3), 87-95. Fujita S, Murata K, et al. (2002) A new adzuki bean variety "Syumari" with soil-borne disease resistance and excellent processing quality. Bulletin of Hokkaido Prefectural Agricultural Experiment Stations(82), 31-40. Fujita S, Shimada H, Aoyama S, Murata K, Chiba I, Matsukawa I (2005) A new white Adzuki bean "kita-hotaru" with excellent processing quality and soil-borne disease resistance. Bulletin of Hokkaido Prefectural Agricultural Experiment Stations(88), 13-24. Fujita S, Shimada H, Murata K, Aoyama S, Chiba I, Matsukawa I, Minami M (2003) A new Dainagon-brand adzuki bean "Toyomi-dainagon" with excellent seed quality and soil-borne disease resistance. Bulletin of Hokkaido Prefectural Agricultural Experiment Stations(84), 25-36. Fukuda T, Maruyama N, Salleh MRM, Mikami B, Utsumi S (2008) Characterization and crystallography of recombinant 7S globulins of Adzuki bean and structure-function relationships with 7S globulins of various crops. Journal of Agricultural and Food Chemistry 56(11), 4145-4153. Fukuda T, Prak K, Fujioka M, Maruyama N, Utsumi S (2007) Physicochemical properties of native adzuki bean (Vigna angularis) 7S globulin and the molecular cloning of its cDNA isoforms. Journal of Agricultural and Food Chemistry 55(9), 3667-3674. Fukushima M, Ohashi T, Kojima M, Ohba K, Shimizu H, Sonoyama K, Nakano M (2001) Low density lipoprotein receptor mRNA in rat liver is affected by resistant starch of beans. Lipids 36(2), 129-134. Fuller DQ (2007) Contrasting patterns in crop domestication and domestication rates: recent archaeobotanical insights from the Old World. Annals of Botany 100(5), 903-924.